The DSC is our Nation's second highest award for military valor, behind only the Medal of Honor. 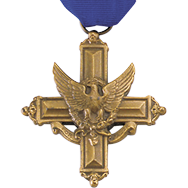 The Distinguished Service Cross was established in 1918 to honor heroism of the highest degree that did not quite merit the Medal of Honor. The Navy Cross (Navy, Marines & Coast Guard) and the Air Force Cross all join the DSC as our Nation's second highest military award.